Imagine this. You and some buddies pack a bunch of stuff into a truck or SUV or Subaru and head off into the wild for the night. You carry with you some snacks, perhaps an adult beverage or two, a headlamp (because it’s going to be dark out there! ), and some gear. When you arrive at some place that’s truly out in the middle of nowhere, you set up some sort of frame, drape a white sheet over it, and shine some lights on it. Then you wait. You spend the next several hours drinking your adult beverages, lounging in camp chairs, and exclaiming with glee that “Citheronia splendans” or some other spectacular insect just showed up on the sheet. Woo! Some people sit and talk, others stalk the sheets obsessively with collecting jars or glassine envelopes, and still others collect photographs only. Maybe you stay overnight, or maybe you pack up about 2am and drive back to town. Either way, you’ve just experienced a beloved pastime/collecting technique of entomologists everywhere: blacklighting. I love blacklighting! I was hooked on it from my very first blacklighting trip. You’ll see things at lights at night that you might never see anywhere else. But, lugging a bunch of lights and associated equipment into the field is a pain. 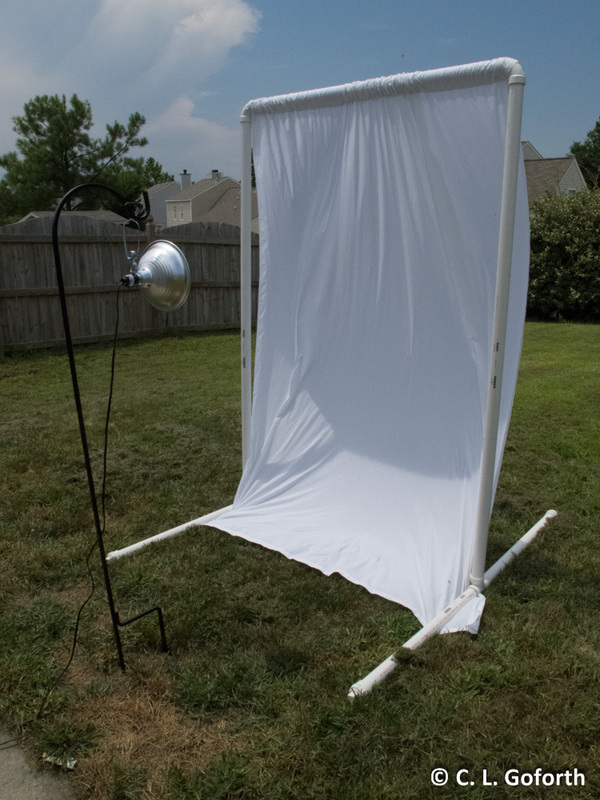 After observing dozens of rigs utilized by a variety of entomologists and blacklighting extensively myself, I set out to design a portable, collapsible blacklighting rig that didn’t require a generator (those things are heavy and often very loud) and I could set up and break down within a few minutes. Today I’m going to share what I came up with. First, let’s talk about surfaces. Blacklighting rigs usually have some sort of white surface on which you shine your lights. That surfaces reflects the light and glows, but it also gives the insects something to hold onto when they arrive. Most entomologists I know rely on white bedsheets. I buy mine from Goodwill because you can walk out with a big pile of sheets for less than the price of a single new one. A hot wash with bleach and you’ve got a cheap, clean sheet to use for your rig! My favorite sheet cost $3. This rig required three 10 foot pipes (I used 2 inch diameter pipes, though I’m going with 1 inch next time), two elbow connectors, two t connectors, four threaded end connectors, and four threaded caps to fit inside the end connectors, the latter two only so I wouldn’t get dirt and/or water in the pipes that sit against the ground. For my bases, I cut four short pipe sections of equal length (about 2.5 feet) and used PVC joint compound to fix two of them permanently into the ends of each t connector, then glued the end connectors onto the opposite ends and screwed in the caps. I glued the two elbow connectors to the ends of the pipe that was going to run across the top, and voila: my stand was ready! When I want to set my blacklight frame up, all I have to do is thread my sheet over the horizontal top pipe, push one end of the upright pipes into the t connectors, push the other into the elbow joints on the top pipe, and the frame’s in place! I cut a little hole in the center of my sheet and wrap a nylon cord around the top pipe a couple of times and stake the ends into the ground on either side of the frame to keep it from blowing over in the wind. I don’t have a photo of the sheet I currently use with this frame, but I trimmed the width to match the frame, added a few grommets along the sides, and use small pieces of nylon cord or tiny bungee cords to attach the sheet to the vertical pipes and keep it taut. The whole thing takes just a few minutes to set up, and I can easily carry my little bunch of 5 pipes and the sheet with a velcro strap/handle I got at a hardware store. The frame cost about $20 altogether, including the joint compound. That means my whole frame with the sheet cost less than $25 – a WHOLE lot cheaper than the $150+ portable models! In more remote areas, I usually use a portable jump starter as my power source and plug in a DC powered blacklight bulb from Bioquip, which is what you see in the image at the top. I can get a good 8 hours of run time from a single charge of the jump starter, which I think is pretty good given the ease of using it and minimal weight. Sometimes I’ll get a little more fancy in the field and use two of the clamp lamps, each with a CFL blacklight bulb, plug them into a multi-socket extension cord, and plug that into my portable jump starter via a power inverter. It requires a little more gear, so more to carry, and the jump starter battery doesn’t last quite as long, but you can get some really excellent light for about half a night that way. A lot of people who blacklight to collect things for research favor mercury vapor lights, but I do not have one. They’re painfully bright for me, can’t get wet (they tend to explode when cool water hits the massively hot glass! ), are a burn and fire risk, and they use more power. If I ever decide to take a mercury vapor light into the field with me, I will break down and buy a real generator, but it certainly won’t be as portable as my current rig. The things I like most about my rig are that I can carry the pipes in one hand, the jump starter in the other, and the rest in a backpack and walk a pretty good ways with everything, so it’s very portable. The lights stay on a long time because they draw a very small amount of power, whether I use the CFLs or the UV light, and that’s great. I get a pretty good diversity of insects coming to this rig, regardless of where I’ve set it up, so I know it is reasonably attractive to a lot of night active insects. I can set this baby up anywhere – it’s free standing and battery powered. The main downside is that it’s not sturdy enough to withstand high winds and blows over if the winds pick up. Of course, you don’t get a whole lot of insects on very windy nights anyway, so I think it’s a small price to pay to have a lightweight, portable rig I can easily chuck in my car and take with me anywhere I want to go. There are endless variations on blacklighting rigs and setups, so this might not be the best solution for everyone, but it works for me. Anyone want to share some alternative setups so that we can all learn from each other and steal each other’s ideas? 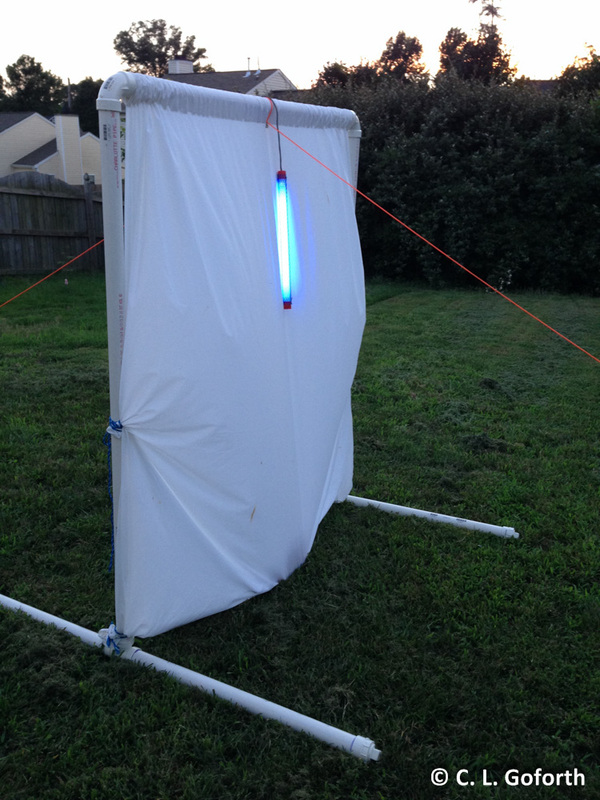 I’d love to see/hear about what other people are using to attract insects at night – leave ideas in the comments! It’s super easy – very few tools or skills required! Awesome looking rig! I’ll have to try this – it’s definitely true that hauling a generator into the middle of nowhere is always a pain. Thanks for sharing! You’re welcome! Hope I gave you some ideas.